It’s time for the first Screen Actors Guild nomination predictions from The Gold Rush Gang but just because there are fewer categories than The Golden Globes or The Oscar doesn’t mean it’s not as difficult to suss out. In many ways, it’s harder. Between category submission deadlines (October 22nd) and some films not even finished as we predict them, there aren’t a lot of safe bets. Let’s start with the ones that seem the easiest. Spotlight, the Tom McCarthy-directed dramatic thriller is a sure bet for a Cast nomination, no one would disagree with that. Room, even with a relatively small cast, has huge support for a nomination there, as does the Steven Spielberg Cold War drama Bridge of Spies. Ridley Scott’s The Martian has 6/10 Gold Rush Gang members voting for it. While it might seem strange at first since most of the time it’s just the Matt Damon Show, you can’t dismiss that there is a large supporting cast of SAG, Oscar and Emmy nominees to bolster the film all way to a top nom here. The Big Short has a smattering of votes based on its high profile cast, also full of Oscar and Emmy nominees. Even box office flop Steve Jobs, also a film boasting SAG and Oscar winners and nominees as well as Emmy winners and nominees, has support. The real questions come from the three films that haven’t been completed or seen in their entirety yet; The Hateful Eight, Joy and The Revenant. The funny thing is, we’ve been here before with Quentin Tarantino (Django Unchained in 2012), David O. Russell (American Hustle in 2013) and Leonardo DiCaprio (The Wolf of Wall Street in 2013). All December releases who didn’t get screeners out in time to reap a wealth of SAG nominations. Now generally, momentum is a big part of riding the awards wave through the entire season. 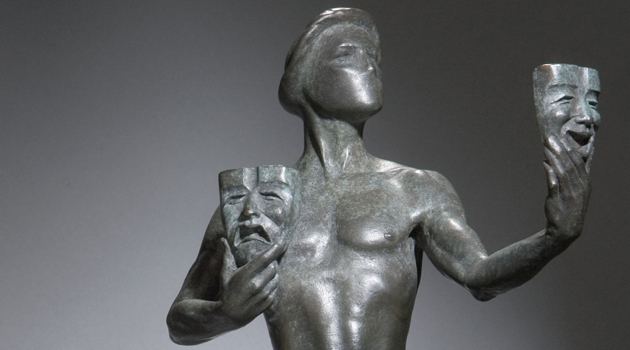 The SAG nominations are the first industry awards and can set the pace for the Oscar race. If you’re missing here you’re already behind a slew of summer and fall releases that have their campaigns in place. Now, in the case of the three films I mentioned it all actually worked out quite well for them when it came to The Oscars. Django Unchained ended up winning two (including one for the non-SAG nominated Christoph Waltz), American Hustle grabbed 10 Oscar nominations (winning none) and The Wolf of Wall Street hit with 5, including two acting nods (for Leonardo DiCaprio and Jonah Miller). This year, The Hateful Eight could suffer the fate of Django and not be ready in time for SAG but still play well with the Academy. Same goes for The Revenant. It could end up just like WOWS; snubbed at SAG and then show up at The Oscars with a Leo nom and one for his male co-star. The case of American Hustle is an odd one and one that I think factors most importantly this year. The film was screened very late and ended up with nominations for the Cast and for Jennifer Lawrence in Supporting. It actually won the SAG award for Cast in a Motion Picture. But where were eventual Oscar nominees Amy Adams, Christian Bale and Bradley Cooper? Obviously the SAG nominating committee saw the film in time to nominate it and Lawrence so why not go all in? Or was it a blind vote? That brings us to David O. Russell’s Joy. We know the film has test screened twice and is still trying to find the tone and story it wants to tell but time is running out. Although it appears to be following a very similar trajectory to American Hustle in terms of screening, AH was released a full two weeks before Joy. We could very well see it play out just the same with SAG though, a nomination for the Cast and for Lawrence and nothing else built totally on name and rep. But that only gets you so far. Screen Actors Guild nominations are screener-dependent more than any other industry award and getting them into the hands of voters is crucial. You can have all of the SAG screenings and Q&As you want but it will never reach as many people as a screener in hand will.